I can’t say enough wonderful things about this Food Memory contributor. Josey has been my pal longer than I can remember. She knew me during those awkward adolescent years, and doesn’t hold it against me. Yes, I may have been a willing participant in the hijinks but SHE was the one that got us kicked out of the library. To this day, I’ll never understand how it came across that I was the bad influence. That moment aside, we balanced each others personalities. I was loud and hasty, rash and a wee bit reckless. She was quiet and thoughtful, focused and more reserved. And we both were addicted to watching the Solid Gold Dancers. We usually did it while on the phone together so that we could accurately critique the gold lame, big hair, and Marilyn McCoo. See what I said about not holding my past against me? Not only is she forgiving like that, she’s a superb story teller with her own blog (when she gets around to writing), an excellent travel companion when you decide to throw caution to the wind and fly across the Atlantic because you need to shake things up, and she’s got a recipe for the Best Damn Pancakes I’ve Ever Eaten. I’ll let her tell you about them. I do not enjoy cooking. Were it not for children my culinary life would be a series of pizza boxes and take-out containers. But I like sitting down to dinner with my family. It’s relatively calm and we can talk about things there’s no other opportunity to talk about. I read to them; poetry and stories, newspaper articles… We connect. I remember when we first moved into this house – opening the kitchen cabinets to find the doors plastered inside with recipes torn from magazines and bits of cooking advice: 3 teaspoons in a tablespoon, add lemon juice to milk as a substitute for buttermilk, Libby’s Famous Pumpkin Pie recipe, “How Anne Put the Snap Back in Her Beans”. It reminded me of my tiny apartment when I was nineteen. Except inside the kitchen cabinets I’d taped up a favorite poem, a little etching of Montmarte, and a hot guy. Or one I thought was hot. Probably Sean Connery. I found him pretty hot at the time. Mrs Campbell hadn’t left any hot guys to fan myself over, but what she did leave I couldn’t bring myself to take down. There was a connection. I could imagine her cooking in this kitchen everyday, consulting the cabinet doors, trying to put the snap back in her beans. Confidentially? There are days. There are days I could use a little more snap in my beans. I do not enjoy cooking. But I want my children to eat well and to have that sense of stability, that world-standing-still that sitting down to a meal gives. No television. No phone calls. No toys at the table. No rushing from one place to another. It sometimes gets derailed – sometimes by me – but I want that for them. I remember my mother calling me in to supper. We mostly called it supper then and in my memory it was pork chops and beef stroganoff and pepper steak and stuffed green peppers and fried chicken. Stewed tomatoes, succotash, pinto beans with rice. Potatoes baked, fried, and scalloped. Apple fritters. Oh, how I loved the apple fritters! We had a big garden that stretched from the lilac bush all the way back to where cornfields marked the end of our property. We ate a lot of corn. It was feed corn – not what you buy in the grocery – but my mother would find the small, young ears and strip the husk back to show me the tender kernels. We bought milk at the dairy and eggs from a farm nearby. She had a mortar and pestle for herbs and I was fascinated by it. My mother knew how to cook. The meal I loved best though was pancakes. I can see Aunt Jeanie and Mom elbow to elbow at the stove, cracking jokes and making a mess. I wanted to watch. The first pancake was half-cooked, half-folded goo; the stovetop hadn’t been hot enough. A little shake and flick of the spatula and it dropped into the trash. “The first pancake’s meant to be thrown away.” Aunt Jeanie said. “It’s just for practice, like the first kid.” I am the oldest. I have a pretty good sense of humor about this. They showed me to keep the skillet just hot enough to sizzle, not scorch. When the batter bubbles, it’s time to flip. Flip quick and straight. No one wants to eat a pancake that landed in the sink. I’d only baked in my Holly Hobbie Easy-Bake oven. I couldn’t imagine making food so big and lively it could leap into the air. Aunt Jeanie demonstrated. Mom laughed and pushed her away. If we’d sit down and be quiet they promised us silver dollar pancakes. We scrambled into our seats and zipped our lips. Then they got serious. 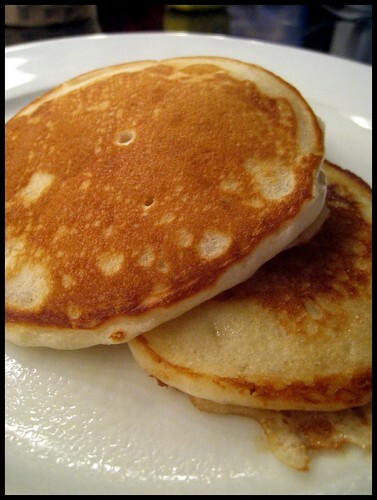 Three-inch pancakes piled high, slathered in butter and dripping with syrup, shared with cousins as close as sisters. Nothing better. The winter I was seven a blizzard kept us snowed in for days. Cousins trudged across the field for snowball fights. There was hot cocoa and, within a few days, pancakes for supper. The food was running out. The roads were closed, but Uncle Walter walked up to dig out my mother’s car and put chains on the tires so she could go to the store. This was wonderful and it made me sad. I was enjoying the pancakes. We pretended to camp in the living room and ate them at the coffee table. I’d never been camping so this was really roughing it. My mother’s spider plants were cactuses and the gold drapes were rays of the hot sun, beating down mercilessly. We were in Marlboro Country. My strip of bacon became a cigarette. If only I’d had a cowboy hat. Tonight we’re having pancakes. My daughter wants to cook. I show her my super-scientific way of knowing when the skillet is ready. Flick water onto it and see if it sizzles. I make a pretense of running my hand under the faucet. I don’t tell her I often wet my fingers in my mouth because it’s easier. That’s unhygienic and possibly morally wrong. She knows to use only a bit of butter to grease the pan, adding more as needed. She knows to watch for bubbles rising in the batter. But she keeps turning around to talk so I stand next to her at the stove. Cooking bores me honestly, but pancakes are different. I like to watch the liquid pour into the pan and change into something solid. It’s art. And I like sharing this with my daughter. I have a poem ready to read at the table. out, one hundred megawatts of butter. Mix together the milk, egg, and butter. Splash some vanilla in if it’s close by. In a separate bowl, sift together the flour, baking powder, salt, and sugar. Sift again; it’s good for you. Make a well in the center and add the liquid ingredients. Mix just until smooth. Minimal mixing will give you fluffier pancakes. If the batter seems thick enough to stand on its own and step into the skillet go ahead and add a little water. No more than a quarter cup. BAH Note: the batter really will thicken up so I suggest you have a quarter cup of something ready to thin things out. I used buttermilk because I had some handy. You probably know the rest. Heat a lightly oiled something over medium-high heat. Obviously I prefer butter in a skillet, but it’s tricky stuff – both the butter and the spatula-challenged skillet. The cast iron skillet is part of my childhood, but you might find you prefer a griddle. It’s okay if you do. Who you eat them with is the important part. J, we absolutely enjoyed the pancakes. Thank you for sharing the recipe, and your memory of them. The Solid Gold dancers, I’d rather forget. And for the record, I did not get us kicked out of the library. I am a good girl. J, I will give you that I have chosen to forget many, many things about those years. So are you saying it was those boys we were with that got us kicked out of the CCPL? Just lovely, from start to finish. Other J, she may have gotten me kicked out of the library but I love her dearly. You will too if you give these pancakes a try. I love this food memory! My kids were just telling someone last night, “We always have breakfast for dinner, but not breakfast for breakfast!” ha! And the butter poem reminds me of my grandfather. When he was a kid on hot summer days, he’d grab a stick of butter and eat it like it was a Popsicle! Thanks for triggering memories for me! Kristin, I love breakfast for dinner. I think I need to come to your house one night. As much as I heart butter, I can’t imagine eating a stick of it like a popsicle. But I do hope thinking of that brought a smile to your face. The stories with the recipes make this project LIVE!